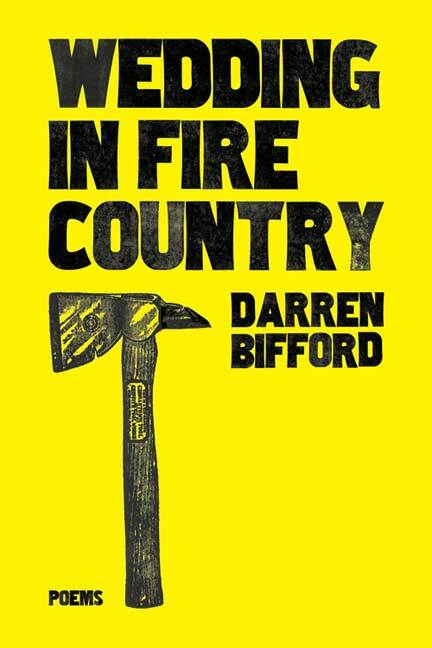 Published in 2012 by Nightwood Editions, Wedding in Fire Country was a surprise hit for me. I picked it up for a friend’s birthday, and before giving it to him I read a couple of pieces. I was hooked. I gave it to him with a ringing endorsement. He claims it’s his favourite book I’ve given him, after George Murray’s Whiteout. Wedding in Fire Country opens with Prometheus. We are challenged to reconsider what we think we know – perhaps the discovery of fire was an accident, he was there for something else, and made a mistake. The poem concludes with the line “like a dynamite wick / history’s cord was lit“ which I think is a fabulous was to set up a book. We have now a suspicion of the common knowledge, a reason to doubt what’s been told to us. We move onto a series of poems called Letters to Milosz. Bifford pens nine poems, nine letters, to Czeslaw Milosz, asking him questions and looking to the past for some sort of wisdom. I’ve chosen my favourite line from each of the series. we despair or we forget about it. Forget about it. let me at least remember a few things about horses. and rivers, you say. Listen. O what about them? Water is exchanged for rapids. (and rapids for all things). This series is a set of questions and possibilities and juxtapositions we remain ever unqualified to answer or solve. There is little room for grey area in these poems, the reader comes away desiring a stark answer, a clear way out. Czeslaw Milosz spent a life in exile, and Bifford examines exile, and greed, and the hunger of a mind able to survive that. We move on to Crow Killer, “a beautiful girl once confessed / she killed a crow“. We pair beauty with murder here, as well as guilt and revenge. The crow’s mate follows the girl the rest of her life, always on the edge of things, waiting. My favourite of the book’s offerings is a set of three poems exploring the romance of Dewey Dell (of As I Lay Dying) and Paul the apostle. This is the highlight of Wedding in Fire Country. Again I’ll share a few lines from each in the series. Who’ll remember your hands, Saul? Why don’t that rent me in two? I’ll hear your horses & go dragged over rocks. tops, over these high jagged rocks here? I enjoy the voice in these poems, it’s very distinct, and pulls you into the narratives of these unfortunate lovers. I also liked the use of Paul’s previous name, Saul, as I think it added an intimacy to the relationship we witness. Summerland, as well as other pieces, tell of girls and horses and the complexity of loving both and neither at the same time. Wedding in Fire Country is a book built on re-imaginings. From Prometheus to Paul the Apostle we explore the terrifying and mundane. In the quiet poems of My Family and Freedom of the Will we discover the simple joys and losses shared between two people. We contain multitudes, and Bifford rearranges us to be stranger or simpler than our assumptions. This is the next book I’ll be discussing, probably posting that this Sunday. The section titled Curio: 12 Photographs is very nearly skippable in my opinion. The two poems that explore the cover’s subject, Toronto’s diving horses, are the only pair that redeem this section. While I consider the poems exploring Toronto’s diving horses to the be the strongest of the folio, they are still a bit heavy-handed for my taste. The rest of the section explores turn of the century photographs that offer us snapshots into the lives of the subjects. With Walking (p12) we are all beneath the same shroud of grief, imagining the weight of our lovers after a great fire. Like some other poems in the book, this opens with an epigraph that provides context (whether this context is needed or not varies from poem to poem) and sets the scene in Nagasaki. “Perhaps he thought: / is this her true weight? was she ever / heavier than this?” the poet wonders as we watch (but also participate) in the collecting of the ashes of the subject’s wife, all that is left of her. I feel this is one of the book’s strongest poems, speaking to our collective empathy as lovers and witnesses to tragedy. Walking both makes an island out of the reader and ruthlessly connects us. Overall I recommend this book, it had a definite readability that makes it enjoyable for bus or car rides. There is more than one poem you will need to read several times over before you are satisfied, that thoughtful hum at the end of reading it will become addictive. I look forward to seeing more of what this poet has to offer in the future.